Who says you can't come back from the dead? Qtrax, which was shut down in 2002, is once again offering free music online. This time legally. 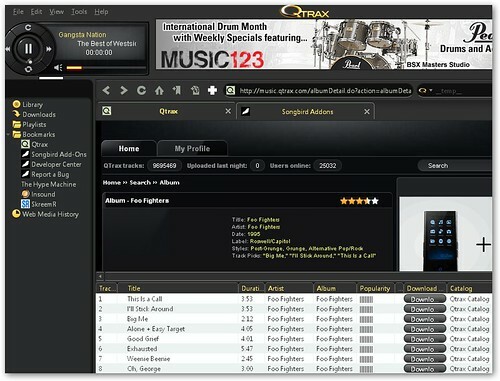 The Qtrax music service boasts a 25 million song-strong library from the major music labels that you can download to your computer. Although the songs are DRM'd, you can also stick them on your iPod and listen anywhere to them. You have to download the Qtrax P2P application, which is based on the open-source Songbird music player, to download songs from other users, but you can get an idea of the available offerings by going to music.qtrax.com, which is having some stability issues from high traffic. Like We7 and SpiralFrog, the Qtrax free music model depends on generating enough advertising revenue to pay the record companies licensing fees based on how many times a song is played. Whether that model is sustainable will decide if Qtrax goes dark once again. See our complete guide to free legal music for more choices.